**Update** Guess what my husband gave me for Valentines Day? Yep. A framed print of Sunflowers and Buffalo Chips. He loves me. There is a picture I love called "Sunflowers and Buffalo Chips" by Gary Kapp. 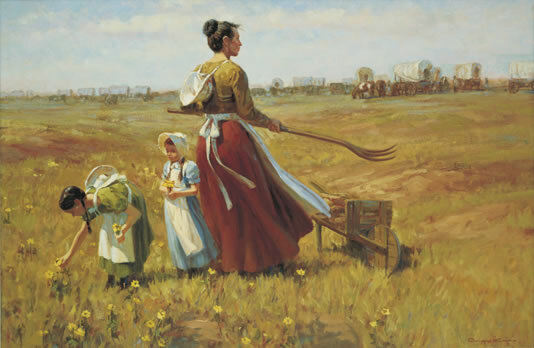 It's a pioneer mother standing in a field of sunflowers gathering buffalo chips to use as fuel so she can cook something to feed her family. I love how her girls ignore the buffalo poop chore and focus on picking sunflowers. I also love how this painting is a perfect metaphor for real life. Sometimes it's sunflowers and everything is going great. We're happy and content in the beauty of life. And sometimes ... it's buffalo chips. We just take the good with the bad and know that we need them both. I gathered a lot of buffalo chips over the last year, hopefully enough to last a long time. So right now, I guess I'll just be thankful that I'm surrounded by sunflowers. What a beautiful picture! I love that metaphor. Where are you going to hang it? This is lovely. Maybe you could hang it in your office, as a reminder? Thanks Daisy. That's actually a good idea since I spend so much time there writing, I'd get to see it more. Gathering the poo as fuel is what I do. The more poo that gets thrown at me in life, the more fuel for me to do better and succeed. Beautiful picture. Hi TJ. Not quite the zombie massacre picture you'd probably want to write about. But I love it. Wow! That picture and the metaphor is simple perfection. Thank you for sharing! I love a good metaphor! That is lovely. Thanks for sharing! You've made me want to get my own! Thanks Erin. I'm loving your posts on Utah Children's writers. Great attitude!! Stopping by from the campaign!! Hi Traci, thanks for stopping by. I checked out your blog and It's really interesting! I love the picture and the analogy! Stopping by from the campaign. Nice to meet you! Howdy, nice to meet you too. Thanks for following. I'm glad you like it. And I loved your post on famous writer's desks! Thanks.